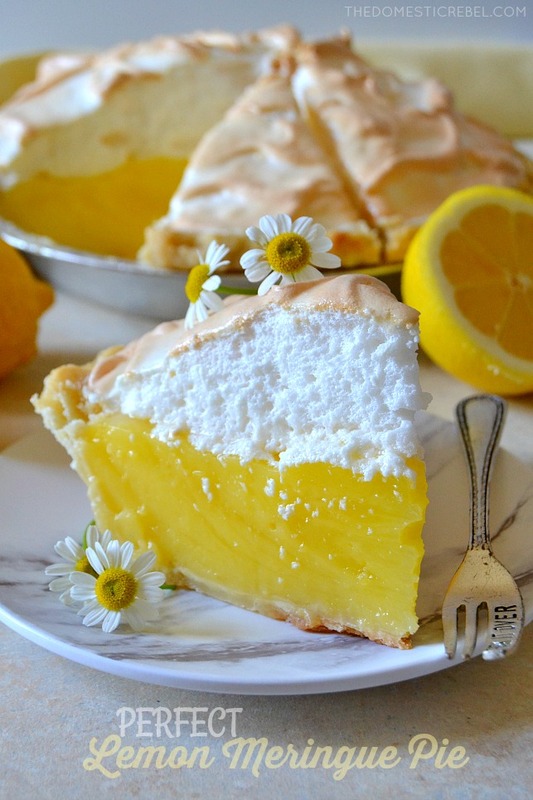 Lemon Meringue Pie often has a reputation of being hard to make, but I promise you, my Perfect Lemon Meringue Pie recipe is easy, delicious, and perfect for all year round! 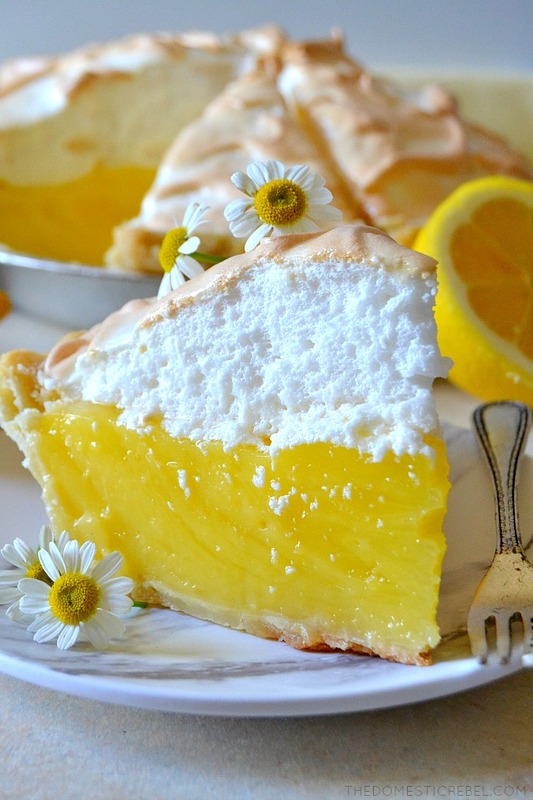 I really cannot think of a more perfect pie for spring, can you? 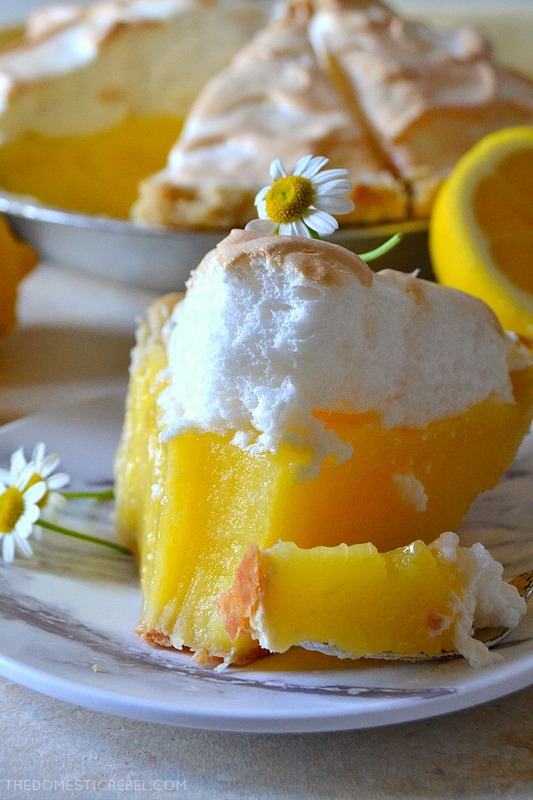 And if you ever thought lemon meringue pie sounds too daunting – whether it be too many eggs that are all separated, or finicky meringue-making, or preparing the lemon custard… well I have to say, I was there too! For the longest time, I put off making this type of pie because frankly, the steps seemed a little scary to me. I know I’m a pretty awesome home baker but could I manage to make a meringue pie without it completely blowing up in my face? I think what helps take some of the pressure off is that components can be made step-by-step which eliminates some of that harried need to scramble and get everything together at once. Between whisking the meringue and cooking the filling, there are a few parts to this recipe, but I promise it will be explained thoroughly so you can get to eating it faster! What I love about this pie is the lemon custard filling. It is so thick and rich and sweet with this tart edge that cuts through some of that sweetness. And the filling recipe makes a TON – just look at how high that filling is piled into the pastry crust! – so there’s no skimpy, barely-there lemon flavor here. It packs a punch, which is what I want my sweet-tart lemon pie to do. And the meringue is a mile-high, sweet and light and airy with a hint of sugar and lots of whipped egg whites for a fluffy cloud that tops the lemon custard. 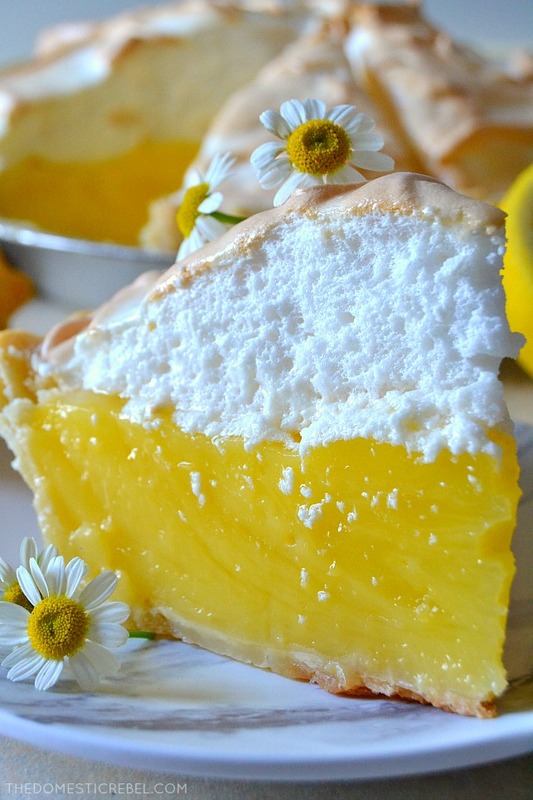 After the meringue is made, you simply spread it high onto the custard pie, sealing the edges of the pie with the meringue and creating little peaks and valleys with your rubber spatula so they get toasted evenly in the oven. 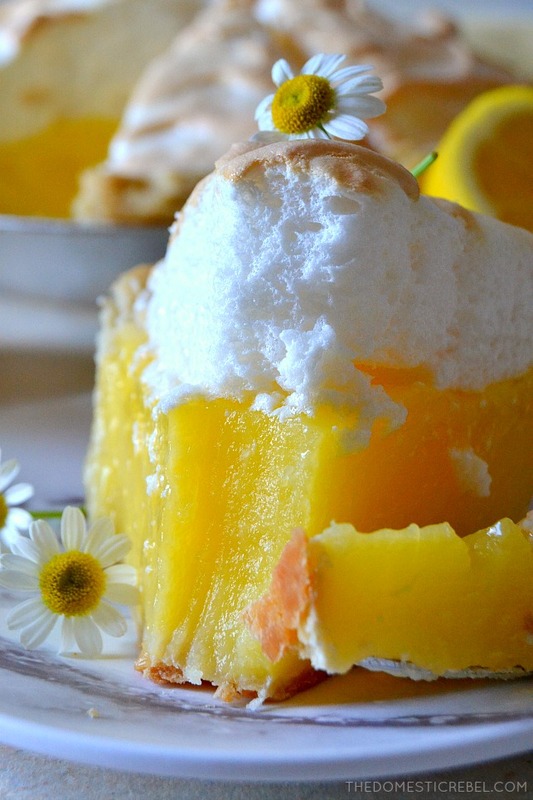 All in all, this Lemon Meringue Pie is not only gorgeous, it’s easy and most importantly, DELICIOUS! I know you’re going to love it! This Perfect Lemon Meringue Pie is one of my new favorites because of how EASY and beautiful it is! A homemade, tart and sweet lemon custard, a flaky pie crust and a mile-high sweetened, fluffy meringue complete this tasty pie. Preheat oven to 325 degrees F. Place the baked pie crust on a rimmed baking sheet to catch any drips once filled. For the lemon custard: In a medium sauce pot, whisk together the granulated sugar, cornstarch and salt until no clumps remain. Add in the egg yolks, water, and lemon juice and whisk until combined. Cook the mixture over medium heat, stirring constantly, until mixture thickens and begins to boil, about 10 minutes. Boil for 1 minute, stirring constantly, then remove from the heat and add in the butter and lemon zest, stirring until combined. Pour the custard into the prepared pie crust. For the meringue: In a very clean and dry bowl of a stand mixer, combine the egg whites and cream of tartar together on HIGH speed with the whisk attachment, just until foamy. Gradually add in the sugar, about one Tablespoon at a time, beating until the mixture forms stiff peaks, about 2-4 minutes. Add in the vanilla and beat well. Spread the meringue quickly over the lemon custard, sealing the custard under a layer of meringue. Pop the pie into the oven and bake for 20-25 minutes, watching closely so the meringue doesn’t burn. It should be light golden brown and toasted. Cool completely at room temperature, then refrigerate for at least 3-4 hours to set before serving. This beauty does need time to chill, but once it is ready, it’s a slice of heaven!